The following are links to downloadable information for clients and further technical information. This guide outlines the construction, wiring and finishing details for the lift pit, shaft and entrances, as well as the requirements for the small machine room that houses the Powerglide HPU and PLC. 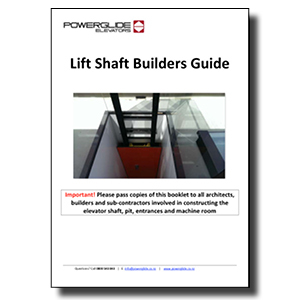 IMPORTANT: Please ensure the main building contractor has read this guide completely before any building work commences on the lift shaft or machine room. For additional or more specific detail about any aspect of the elevator assembly, or to request or enquire about dimensions or specifications different to those listed, please call or email us anytime.